Mankind Quarterly was founded as a quarterly journal of anthropology, in the broadest sense of “the science of man,” in 1961. This was a time when the study of man had already diversified into physical anthropology, ethnography, quantitative cross-cultural research, archaeology and other subspecialties. These developments took place against the background of a widening gulf between the biological and social sciences. Following the leading dogma of the day, cultural and social anthropologists in academe had begun to deny the importance of biology for behavioral and cultural phenomena. Conversely, biological (physical) anthropologists aligned themselves with the “hard” sciences, many describing themselves as human biologists rather than anthropologists in an attempt to distance themselves from a social anthropology that they no longer saw as scientifically sound. In many places, these divisions persist to the present day. Mankind Quarterly was founded as a response to these centrifugal trends. Its founders believed in the interdependence of human biology, behavior and culture, and they understood biological and cultural diversity as the outcomes of evolutionary, ecological, and historic processes. In short, Mankind Quarterly was established as a journal for those scholars who still believed in a unified “science of man” that studies the interactions between biological and cultural diversity. It was first published in Edinburgh, Scotland in 1961, and then, from 1979 to 2014, by the Council for Social and Economic Studies (chaired by Roger Pearson) in Washington, D.C. In January 2015, publication was transferred to the Ulster Institute for Social Research, a non-profit organization in London, England. 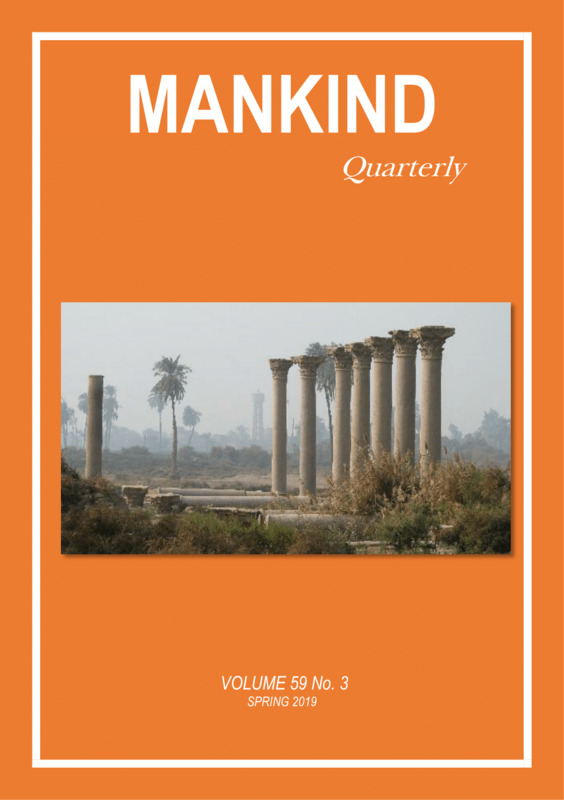 Throughout its existence, Mankind Quarterly has maintained its character as a journal devoted to the interdisciplinary study of man. New developments in the field were reflected in the journal early on. When first sociobiology and then evolutionary psychology developed descriptions of human nature and explanations for cultural universals, the new developments found expression in the journal. The same happened with behavioral genetics, which like sociobiology saw major advances during the last three decades of the 20th century. Today the editorial board includes scholars from 12 countries who represent a wide variety of disciplines including primatology, physical anthropology, archaeology, cultural anthropology, human genetics, differential psychology, sociology, and history. Despite their varied expertise and views, the editors share a common interest in the evolutionary and historical processes that generate human diversity, and in the universal features of human nature that constrain this diversity. Because history and biological evolution are ongoing processes, this includes an interest in the social, cultural, demographic and biological changes that are taking place in modern societies. Some of the articles the journal publishes deal with the evolutionary and historic processes that have created the racial, ethnic, linguistic and cultural diversity we see today. Others describe present-day cultural diversity and ongoing trends, especially at the psychological level. During the last years, intelligence and its change over time have been especially active research areas, and a substantial part of this work has been published in Mankind Quarterly. The subject is important because education and intelligence are considered the key drivers of cultural change and economic growth, not only in developing countries but also in mature postindustrial societies. Other areas of special interest are the demographic changes that are taking place in countries today and that are shaping the world of the future. Historically, Mankind Quarterly has earned a reputation for publishing articles in controversial areas, including behavioral race differences and the importance of mental ability for individual outcomes and group differences. During the “Bell Curve wars” of the 1990s, it became a target of attack when opponents realized that some of the work cited by Herrnstein and Murray had first been published in Mankind Quarterly. However, much of this science has stood the test of time. For example, the importance of genes for individual differences in intelligence is no longer controversial, and genetic effects on individual and group differences that were merely inferred in earlier research are now studied at the molecular level. There is nothing wrong with being at the embattled forefront of new scientific developments. Most of the research that the Mankind Quarterly publishes today is “normal” science, but the editors still welcome controversy and new ideas. They see it as part of the journal’s mission to provide a forum for the presentation and discussion of theories and empiric research that challenge entrenched beliefs. Of course, the often contradictory views that are represented in the Mankind Quarterly are those of the individual authors, not those of the journal’s publishers or editors.